Earlier this year, precisely April, Cloudflare announced 1.1.1.1; the privacy-first consumer DNS service. The aim of the service is to speed up consumer internet connection and help make it private – A great consumer DNS service. But sadly, the service was not available to mobile users. But considering the fact that number of mobile internet users far outweighs PC users, has now launched the 1.1.1.1 mobile app to make it easy to use 1.1.1.1 on your Android and iOS mobile phones. 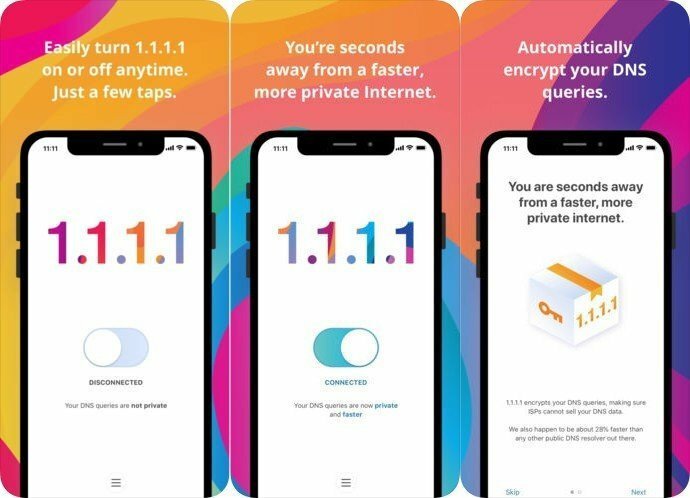 Depending on how successful this app will be, in the future, Cloudflare could make the 1.1.1.1 DNS service app available to other mobile platforms, like windows mobile and Firefox OS. After being in public beta since last month, the app is now available for everyone and makes your Internet faster and more private. The company says that millions of websites rely on Cloudflare for performance and security. By getting more users on 1.1.1.1, it makes those sites faster. You can now download the ‘1.1.1.1: Faster & Safer Internet’ app on both Android and iOS for free. Anyone can use the DNS resolver and the company claims it to be “the Internet’s fastest, privacy-first consumer DNS service.” DNS is an essential part of the internet and it is typically offered by internet service providers to resolve domain names into a real IP address that routers and switches understand. Since the DNS servers provided by ISPs are often slow and use the DNS servers to identify all sites that are visited, there is often scope for privacy concerns. Open and activate the app, and that’s all. While Cloudflare’s 1.1.1.1 has already seen an incredible number of switches, the company says that people are not able to make those changes, particularly on mobile devices. Cloudflare says that it has worked with APNIC to offer its DNS service through 1.1.1.1 and 1.0.0.1. Cloudflare’s DNS offers both DNS-over-TLS and DNS-over-HTTPS. CAUTION: This 29 Android Apps Can Steal From Your Bank, Practically!